OK, we’re all adults here. I think that the time has come to talk seriously about something a little filthy, something that has plagued shooters for decades and something we need to put a stop to, for the good of all of us gun owners. The time has come to clean up our act and get rid of all of our dirty magazines. No, not *that* kind of dirty magazine (jeez – get your mind out of the gutter!). I’m talking about the kind of magazine that goes into your pistol. Sheesh. Seriously, this is one of those details that a lot of people just never think about: that to function properly, a semi-auto firearm (or full auto, for that matter) needs a working magazine and while the magazine is usually a pretty simple component of a pistol, it too needs to be cleaned and maintained regularly (just like any other mechanical component of your gun). Otherwise it can impede smooth functioning of your firearm, and that can lead to very bad things called “weapons malfunctions” and “failures to feed”. The beauty part is though that almost all modern handguns magazines have been designed so that the average person can disassemble and then easily reassemble them, though I have known plenty of people over the years who either didn’t know this (or really just forget to check/clean their magazines regularly). 1.Body – this is the overall housing. 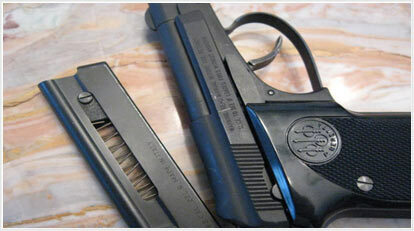 2.Spring – the internal part that pushes cartridges up into the pistol. 4.Floor plate – the bit at the bottom of the body that holds the spring and follower in place. One other part I want to mention, though it is not a ‘main part’ is the (feed) lips. This is the upper part of the body that helps to position cartridges properly within the pistol so that they can be transferred from the magazine into the chamber of the gun. Sometimes these can become pinched, which could lead to failure to feeds. 1.Take a magazine for one of your guns. 2.Remove all the cartridges from your magazine. 3.Examine the magazine, looking for obvious wearing or breakage (rare, but it happens). 4.Look at the floor plate. There should be some variety of clip or clasp that keeps it in place and it might need a small part to be moved, or a little spring latch tripped (usually with a small rod or nail). 5.Slide off the bottom of the body once you remove the floor plate. Be careful when doing this, since the spring inside the magazine will be under some pressure and may want to shoot out (finding this smaller piece once its been lost can be a challenge too). 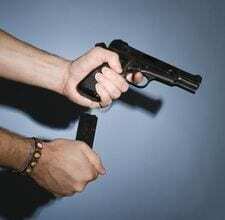 6.Take out the spring and follower from the bottom of the magazine. The follower may be mounted to the top of the spring, or it may be free and just held in place by spring tension. Try to pay attention to this as you remove the spring. 1.Clean the inside of the body thoroughly, using your usual gun cleaners and tools. 2.Look at the top of the body, where the lips are. Make sure that these are cleaned inside and out as well. 3.Examine the spring, checking for built-up dirt or rust. Wipe down with a rag & some cleaner, then lubricate lightly. 4.Do the same for the follower and floor plate. And two, I don’t “top off” my magazines any longer. 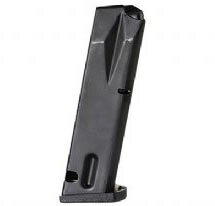 “Topping off” is where you fill a magazine, place it into a pistol, then chamber a round, and then remove the magazine and place another cartridge into the magazine before replacing it. You’ll see a lot of people refer to a given gun as “10 + 1″ or “14 + 1″. This is what they mean, and it is tempting to do in order to have an extra cartridge. I used to do this regularly and usually I didn’t have any problems with my various pistols when I did. But every once in a while I’d get a failure of a gun to cycle properly after the first shot. I discussed it with friends, and one buddy who is an armorer for a SWAT team said that he’d stopped “topping off” for his department, and that it eliminated these rare but occasional problems. His theory was that the additional pressure of a completely full magazine on the operating mechanism slowed it down just enough to mess up the timing of the gun when it was fired, and so presented a problem. Since I’ve adopted the practice of regularly cleaning my gun and filling my magazine only to capacity, I haven’t had any feeding problems and, if only for my own peace of mind, I’ve just made it my routine. Your preference, like your mileage, may vary.